At 726 St. Peter Street in the French Quarter of New Orleans, there’s a dilapidated-looking building where people come to hear music nightly. That alone would not make Preservation Hall any different from thousands of other spots in this most celebratory of cities. What distinguishes Preservation Hall is what’s not happening there — no drinks are served, there’s no air conditioning, and there’s not even running water. Yet despite, and perhaps in some ways because of, this spartan atmosphere, there’s something unique about the feeling generated there, and it’s now been 50 years that people have been coming to Preservation Hall to hear the authentic original sound of jazz in the traditional New Orleans style. In just a few days, Santa Barbara will be hit with a double dose of this soulful Creole concoction, as the new Preservation Hall documentary film, Live at Preservation Hall: Louisiana Fairytale (featuring My Morning Jacket), screens at the Lobero on Tuesday, January 31, as part of the Santa Barbara International Film Festival, and the Preservation Hall Jazz Band plays a live concert at UCSB’s Campbell Hall on Wednesday, February 1, courtesy of Arts & Lectures. Both events should be righteous and raucous affairs, and a special appearance by Jim James of My Morning Jacket is promised as part of the fun surrounding the film, which was made on location in the French Quarter by director/photographer Danny Clinch. The film, which was originally scheduled to screen at UCSB last week as part of the Arts & Lectures series on the music of New Orleans, was preempted when it got picked up by the Film Festival, but what the Campbell Hall audience got instead on Wednesday, January 18, was at least as exciting and more intimate, as Preservation Hall’s current director, Ben Jaffe, the son of Pres Hall founders Allan and Sandra Jaffe, came to town with a hard drive loaded with rare footage of the Preservation Hall Jazz Band and other great New Orleans jazz bands going all the way back to the very early 20th century. Jaffe used the footage to highlight the personalities, the playing styles, and the cultural heritage that the Preservation Hall organization, whether at home or on the road, exists to preserve and promote. His story, which is embedded deeply not only in the world of classic traditional jazz but also in the legacy of the civil rights movement (of which his parents were a part), shows just how much is possible when people come together over music for its own sake. Without Allan Jaffe, Sandra Jaffe, and now their son Ben — an affable 40-year-old in a sharp three-piece suit with a cascading head of Sideshow Bob–style curls — some of the most important original music ever to be created in this country might not exist today. When Allan and Sandra arrived in the French Quarter in 1961, Jim Crow was very much still in effect, and by virtue of the fact that they presented racially mixed groups on the same public stage, they were often harassed by the racist public, and sometimes jailed overnight by the police. Allan was a big man with a powerful voice, and he played the tuba. His son Ben may be more soft-spoken, but he too pumps out a mean brass bass line on the same instrument his dad played in the original Preservation Hall Band. The latest version of the group is fresh off of a triumphant and star-studded 50th-anniversary show at Carnegie Hall, and the Campbell Hall show promises to be a fiery blast of pure New Orleans joy. 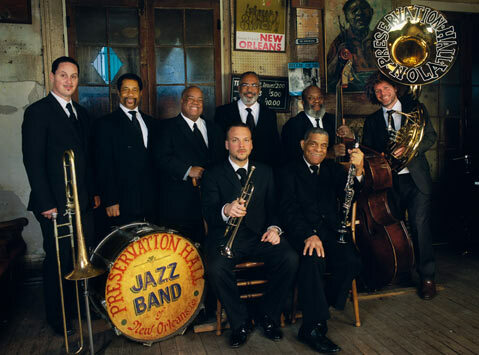 The Preservation Hall Jazz Band performs on Wednesday, February 1, 8 p.m., at UCSB’s Campbell Hall. For tickets and information, call (805) 893-3535 or visit artsandlectures.sa.ucsb.edu. Live at Preservation Hall: Louisiana Fairytale will screen Tuesday, January 31, 7 p.m., at the Lobero Theatre (33 E. Canon Perdido St.), and then again twice more, at 10:30 p.m. on Wednesday, February 1, and at 1 p.m. on Sunday, February 5, with both of those showings at the Metro 4 (618 State St.). For tickets and information about the Film Festival, go to sbiff.org.